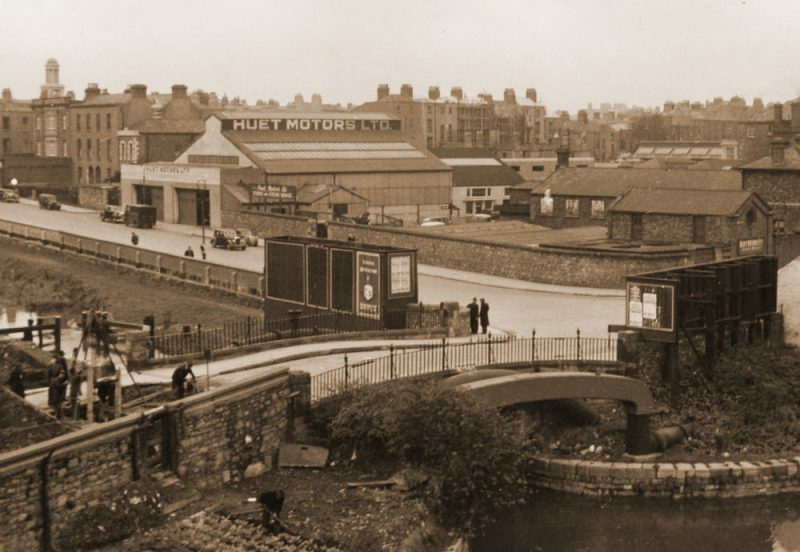 Although commonly referred to as The Battle of Mount Street Bridge, in reality, the battle site covered a much wider area, stretching from the South at the corner of Haddington and Northumberland Roads (where Malone and Grace occupied 25 Northumberland Road), to the most Northward points of Clanwilliam House and Roberts Builders Yard (on the northern side of the Grand Canal). The British troops attempted to reach the bridge, not only from Northumberland Road itself, but also from the laneways to the east and west. This page documents the most important sites of the battle. 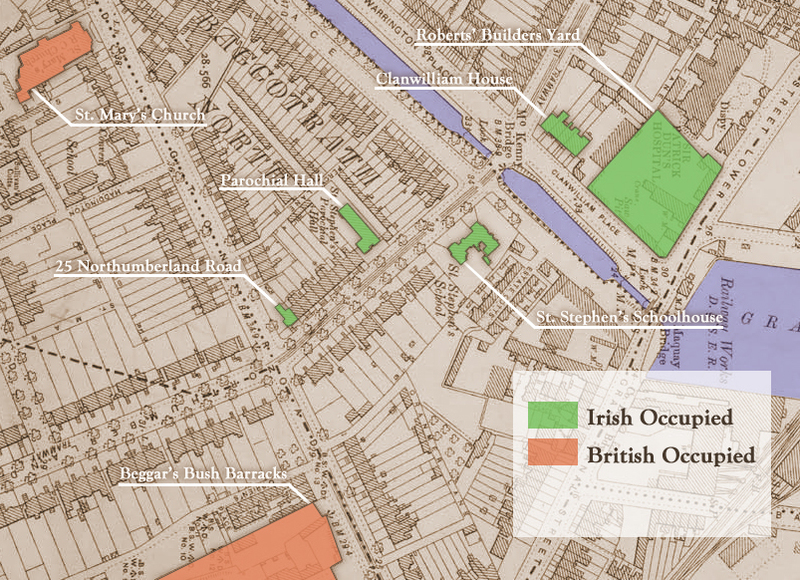 The main buildings and sites occupied during the Battle of Mount Street Bridge. 25 Northumberland Road photographed after the battle in 1916 and showing signs of the engagement. 25 Northumberland Road, located at the corner of the junction with Haddington Road, was held by Volunteers Michael Malone and James Grace. A three-storey, Victorian terraced town-house on the corner of the junction with Haddington Road, 25 Northumberland Road is on the south side of the Grand Canal and a short distance from Mount Street Bridge. It was occupied on Easter Monday by Michael Malone, James Grace, Paddy Rowe and Michael Byrne and was the southernmost location occupied by C Company, 3rd Battalion Dublin Brigade of the Irish Volunteers (Carisbrook House to the south was taken by a different unit). The building was the home of Michael Cussen, described by Grace as ‘friendly’, who had evacuated his family and servants in advance of the Rising (DCLA, Dublin City Electoral Rolls, 1914; Thom’s Directory, 1916; MAI, BMH WS 310). On Easter Monday afternoon, the garrison in No. 25 fired on a column of the Volunteer Training Corps (nicknamed the ‘Gorgeous Wrecks’ for their older age profile and Georgius Rex armbands) returning to Beggar’s Bush barracks after a training exercise. Part-time reservists and made up of professional men, many over military age, the VTC were unarmed or carrying rifles with no ammunition. Five members of the column were killed and seven more wounded. The following morning, teenagers Rowe and Byrne were sent home for their own safety, leaving Malone and Grace as the sole occupants of No. 25 (MAI, BMH WS 310). On Wednesday morning two members of Cumann na mBan, including one of Grace’s sisters, delivered a dispatch with news of the imminent arrival of British troops marching from Kingstown (now Dun Laoghaire). Positioned in a third-floor bathroom window, Malone was the first Volunteer to open fire on the advancing Sherwood Foresters with Grace following suit from a window on the second-floor. Their positions offered an ideal field of fire in which to engage British troops moving up Northumberland Road towards the city and along Haddington Road. No. 25 was the first rebel position to fall after it was repeatedly charged by 2/7th Sherwood Foresters armed with hand grenades and its door blown in. Malone was killed by rifle fire but Grace managed to escape (MAI, MSPR 34/REF/368; MAI, BMH WS 310). Parochial Hall occupied by Irish Volunteers. Photographed in the 1940s by the Irish Bureau of Military History. 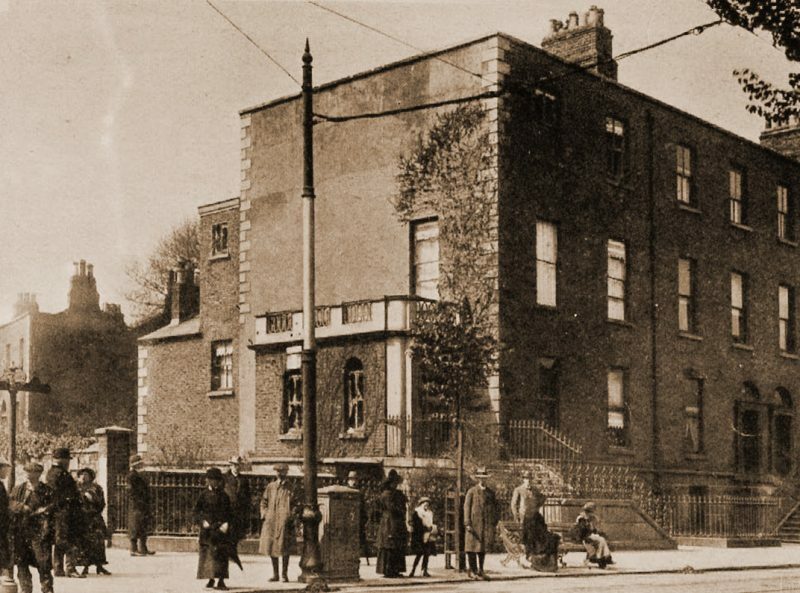 St. Stephen’s Parochial Hall, 1-5 Northumberland Road, was a Church of Ireland hall occupied by four members of C Company, 3rd Battalion, Dublin Brigade of the Irish Volunteers on Easter Monday. In 1916 St. Stephen’s Parochial Hall, Northumberland Road was a Church of Ireland property used for vestry meetings and other Church events. Located opposite St. Stephen’s Schoolhouse and about 300 yards from 25 Northumberland Road, the hall was also the residence of army pensioner Francis James Tanner and his family (NAI, 1911 census return; DCLA, Dublin City Electoral Rolls, 1914; Thom’s Directory, 1916). Volunteer accounts of its occupation on Easter Monday make no mention of the Tanners being present. A two-storey detached building at a recess from the terraces on either side, it was seized by four Volunteers from C Company, 3rd Battalion, Dublin Brigade. Patrick Doyle (section commander), Joseph Clarke, John McGrath and William Christian spent most of Monday and Tuesday on guard duty and ‘except for an occasional shot here and there’ they encountered no opposition on Monday or Tuesday (MAI, BMH WS 646). The Sherwood Foresters advancing along Northumberland Road on Wednesday afternoon were initially unaware that the Parochial Hall was occupied and were targeting St. Stephen’s Schoolhouse on the opposite side of the road. Protected from British attack by the position of their building, the garrison in the hall was forced to wait until British troops came alongside their position before opening fire. Soon after, with their ammunition spent and the attack intensifying, the garrison in the building decided to retreat to Boland’s Bakery, headquarters of the 3rd Battalion under its commandant, Eamon de Valera. Having escaped through the back of the hall and out on to Percy Place, they were fired on and captured by British troops (MAI, BMH WS 646). St. Stephen’s Parochial School House photographed in 1916 after the Battle with British Soldiers on guard. 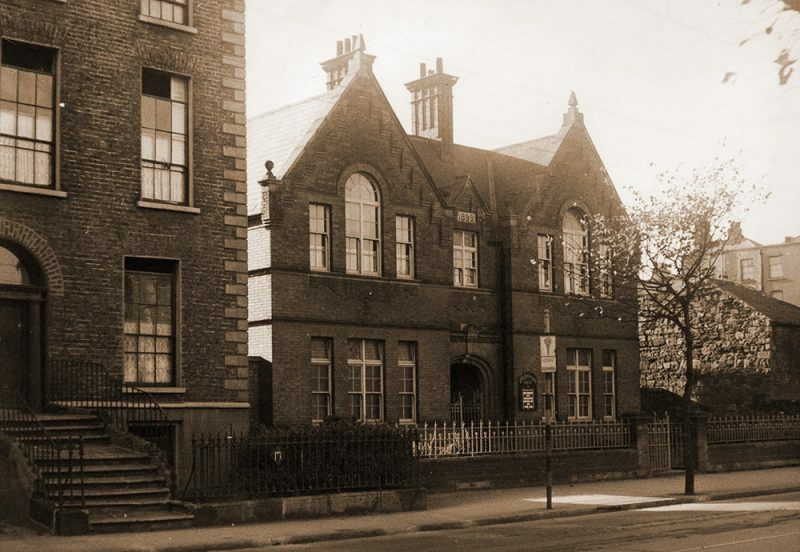 The schoolhouse on Northumberland Road, home of St. Stephen’s Parochial School, was initially occupied by four men from C Company, 3rd Battalion, Dublin Brigade of the Irish Volunteers on Easter Monday. By Tuesday the garrison had been withdrawn and the building remained unoccupied. St. Stephen’s Parochial School was located on Northumberland Road, on the south side of the Grand Canal and close to the embankment at Mount Street Bridge. Administered by the Church of Ireland, the school was housed in a single-story, redbrick building with six rooms. The building was also home to schoolmaster Samuel Flinn. (MAI, 1911 census return; DCLA, Dublin City Electoral Rolls, 1914; Thom’s Directory, 1916). Volunteers Denis O’Donoghue (section commander), Seamus Kavanagh, Robert Cooper and Seamus Doyle took the schoolhouse on Monday morning. O’Donoghue later recalled that ‘The lady at the school objected to us and we broke in’ (MAI, MSPR, 34/REF/20580). They proceeded to fortify the building by barricading windows and doors. It soon became clear, however, that the position was entirely unsuitable and of no military value. On Tuesday evening a decision was made to evacuate the school and move to Boland’s Bakery, headquarters of the 3rd Battalion under its commandant, Eamon de Valera, to reinforce the garrison there. The building remained unoccupied by rebels for the remainder of the Rising (MAI, BMH WS 208; MAI, BMH WS 166). Believing it to be held by the Volunteers, the Sherwood Foresters initially concentrated efforts on taking the empty schoolhouse, ignoring the garrison of four men positioned in St. Stephen’s Parochial Hall on the other side of Northumberland Road (“The Robin Hoods”, 1/7th, 2/7th, 3/7th Sherwood Foresters, 1914-1918, 1921; The Sherwood Foresters in the Great War, 1914-1918, the 2/8th Battalion, 1920). The burnt out shell of Clanwilliam House photographed in 1916 after the Battle. 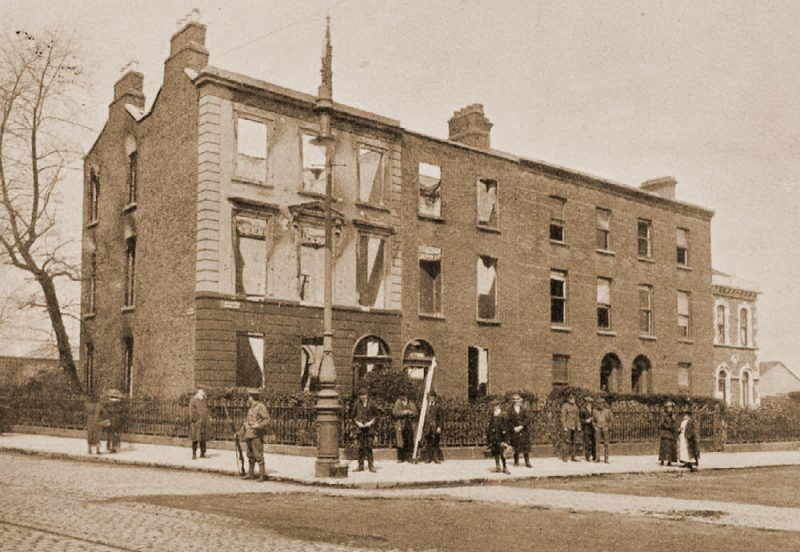 Clanwilliam House, 1-2 Clanwilliam Place, was occupied by seven Volunteers from C Company, 3rd Battalion of the Dublin Brigade on Wednesday morning. It was the last rebel post to be taken. Three of its garrison were killed during the fighting. Clanwilliam House, 1-2 Clanwilliam Place, was part of a row of Georgian houses on the city side of Mount Street Bridge on the intersection with Lower Mount Street and facing the Grand Canal. Samuel Wilson, a retired merchant sailor, his family and servants lived in 1 Clanwilliam Place, while the family and servants of carpenter and contractor Andrew Mathers occupied 2 Clanwilliam Place, next door. (NAI, 1911 census returns; DCLA, Dublin City Electoral Rolls, 1915; Thom’s Directory, 1916). A large, three-storey building, it offered an unobstructed view of the bridge and down Northumberland Road. On Easter Monday, the building was occupied by George Reynolds (section commander), Daniel Byrne, William Ronan and James Doyle, the door having been opened for them by a maid (MAI, BMH WS 309). On Tuesday morning, Paddy Doyle, Richard Murphy and brothers Thomas and James Walsh were sent from Boland’s Bakery, headquarters of the 3rd Battalion under its commandant, Eamon de Valera, to reinforce the garrison in Clanwilliam House. Daniel Byrne was assigned to carry dispatches leaving seven men in possession of Clanwilliam House on Wednesday morning. By that time, furniture had been used to fortify windows but the glass had not been smashed and no other measures taken to prepare for an assault on the building. Each Volunteer was positioned at one of ten second and third storey windows at the front of the house facing the canal. On hearing fire from 25 Northumberland Road, the garrison opened fire on the advancing Sherwood Foresters. Clanwilliam House was the last of the rebel posts to fall following a concerted rush by troops from the 2/8th and 2/7th Sherwood Foresters during which the house caught fire. George Reynolds, Paddy Doyle and Richard Murphy were killed during the fighting (MAI, BMH WS 127; MAI, BMH WS 309; MAI, BMH WS 198). The building remained unoccupied after the Rising until it collapsed during a storm in 1920 (Thom’s Directory, 1917; Irish Independent, 18 Jan. 1920). Roberts’ Builders Yard adjacent to Clanwilliam House photographed in the 1940s by Bureau of Military History. Roberts’ builders yard, located at the Clanwilliam Place end of Grand Canal Street, was occupied by four Volunteers from C Company, 3rd Battalion. The Volunteers there sniped at Sherwood Foresters advancing on Mount Street Bridge before retreating to Boland’s Bakery. Roberts’ builders yard was the premises of W. A. Roberts building contractors and located at the Clanwilliam Place end of Grand Canal Street on the city side of the Grand Canal. The firm was run by Samuel Roberts, Quaker, builder and resident of Milltown in south Dublin. Located at the corner of Grand Canal Street and Clanwilliam Place, the yard was next to Sir Patrick Dun’s Hospital where many of the military, rebel and civilians casualties of the Rising were treated. 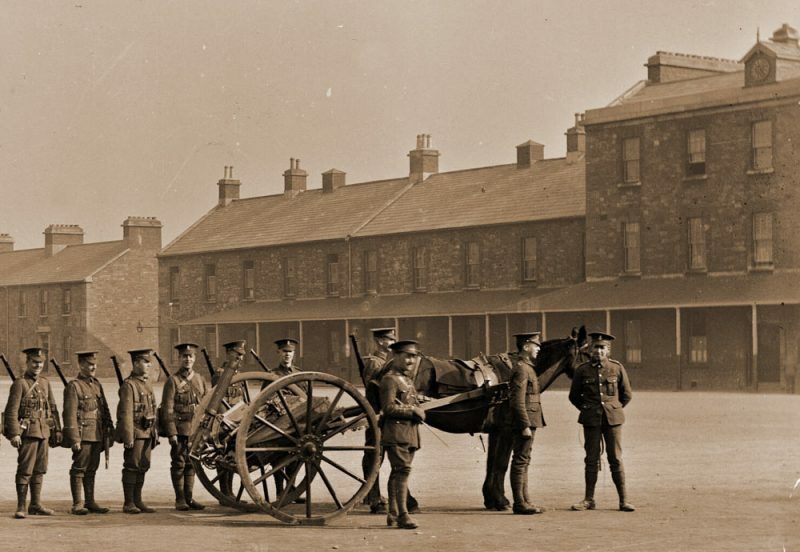 On Wednesday morning Simon Donnelly, commandant of C Company, ordered Seamus Doyle, Robert Cooper, Seamus Kavanagh and section commander Denis O’Donohue (all of whom had evacuated the schoolhouse on Northumberland Road) to take up positions in the yard. Kavanagh later claimed that Roberts’ had been occupied since Monday and that the guard was changed each morning. O’Donoghue, Kavanagh and Doyle positioned themselves on the roof of the yard, behind a wall overlooking the canal, while Cooper faced towards Grand Canal Street Bridge. Having fired at the Sherwood Foresters advancing on Mount Street Bridge, and held their position for some time, an order was delivered calling on the men to retreat to Boland’s Bakery. Denis O’Donoghue claimed that this took place after the fall of Clanwilliam House but Seamus Doyle asserted the order came before Clanwilliam House had caught fire. The men returned to Boland’s over the wall of Patrick Dun’s Hospital and arrived having suffered no casualties (MAI, BMH WS 208; MAI, BMH WS 166; MAI, MSPR, 34/REF/20580; Irish Press, 16 Jun. 1955). St. Mary’s Church, Haddington Road, located on Haddington Road to the west of Northumberland Road, was used by British troops as a sniping position. Two soldiers were injured by fire from rebel positions. St. Mary’s Church, Haddington Road, located on Haddington Road to the west of Northumberland Road was used by British troops as a sniping position. Rev. Dr. Nicholas Donnelly, an auxiliary bishop of Dublin and bishop of Canea, was the parish priest and the church four other clergy. On of the priests, Fr. McKee, died of natural causes during the Rising. 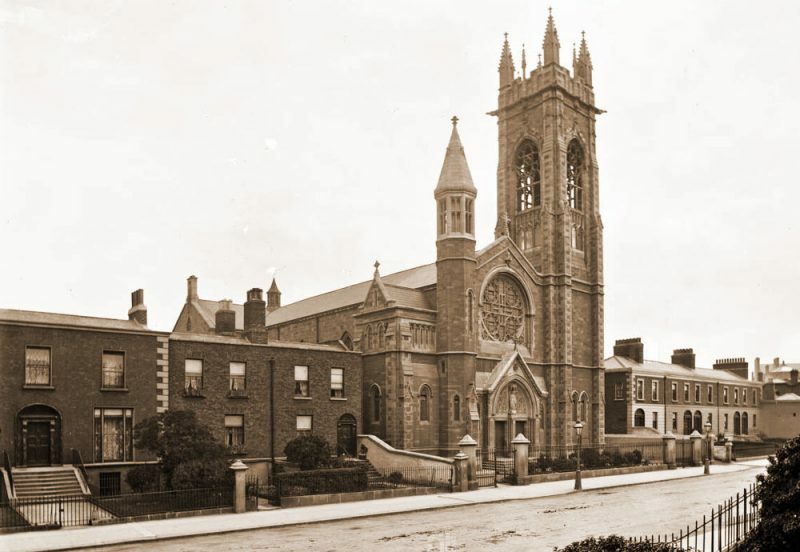 (MAI, BMH WS 311; 1911 census returns) On the Wednesday morning of Easter week the church was occupied by a small number of British soldiers who used the building’s tall belfry to fire on rebel positions, including No. 25 Northumberland Road. Fire was returned from the rebel positions and two of the soldiers were wounded. Medical attention was sent for and the men were treated by two doctors who arrived from the nearby Baggot Street Hospital. One of the doctors described ‘very heavy fighting’ on Northumberland Road and ‘lying 4 hours flat with bullets serging by and striking the tower around us.’ Taking advantage of a lull in the fighting, they managed to escape and made their way back to the hospital (MAI, BMH WS 311; TCD, Ms. Misc. Photocopy 184). Beggar’s Bush Barracks, a military barracks on Haddington Road to the east of the rebel positions on Northumberland Road, was a recruit-training depot for the British army in 1916. The barracks was only occupied by a small number of men with few rifles or ammunition but was not taken by the rebels. 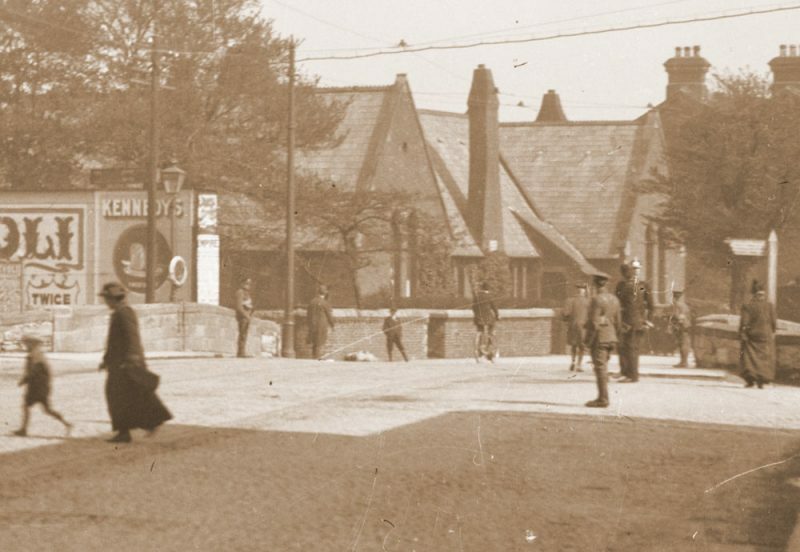 Beggar’s Bush Barracks, a military barracks on Haddington Road to the east of the rebel positions on Northumberland Road, was a recruit-training depot for the British army in 1916. On Easter Monday there were only two regular British officers in the barracks and it held few rifles and little ammunition. A British officer on leave during Easter week and present in the barracks later remarked that there was ‘nothing in Beggars Bush Barracks if only they had rushed it’ but no attempt was made to do so (MAI, BMH WS 348). On Monday morning a column of the Volunteer Training Corps (nicknamed the ‘Gorgeous Wrecks’ for their older age profile and Georgius Rex armbands) were fired on, with five killed and seven wounded. The remainder of the corps spent the rest of the Rising in Beggar’s Bush barracks. The men in the barracks continued to snipe on the rebel positions until a platoon from A Company of the 2/8th Sherwood Foresters was sent there on Wednesday afternoon (MAI, BMH WS 348; The Sherwood Foresters in the Great War, 1914-1918, the 2/8th Battalion, 1920). 25 Northumberland Road was restored after 1916 and a plaque unveiled there on the 50th anniversary of the battle in 1966. 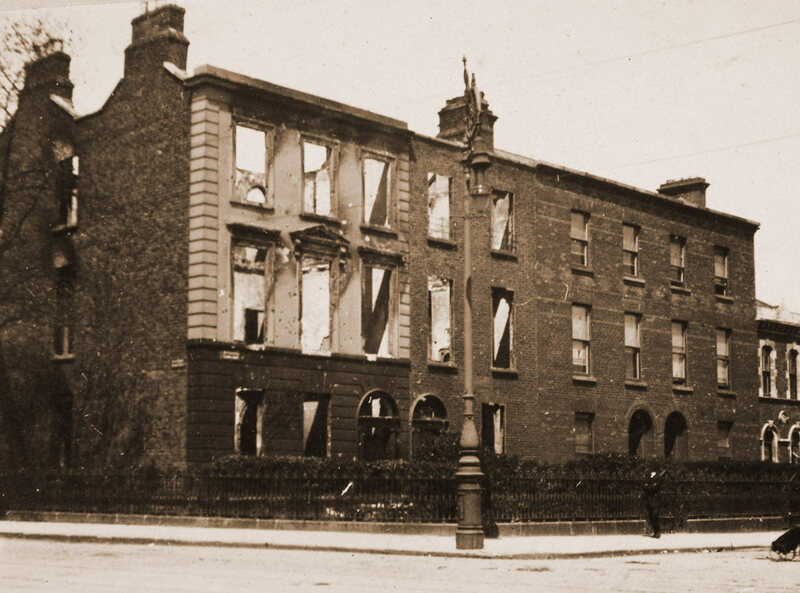 The damage inflicted on Clanwilliam Place during the battle resulted in the buildings being demolished. The house at 25 Northumberland Road where Michael Malone was killed during the Battle of Mount Street Bridge. Clanwilliam Place where George Reynolds, Paddy Doyle, and Richard Murphy were killed during the battle.